UK professional wrestling invariably conjures up images of overweight men in ill-fitting leotards being cheered on by crowds of handbag-waving pensioners. There is also the famous American showbiz circus, Worldwide Wrestling Entertainment (WWE), featuring fighters such as Hulk Hogan and The Rock. In the past few years WWE tribute shows have sold out within hours in Scotland. Now a wrestling group is attempting to create "a Scottish pro-wrestling product for Scottish fans". 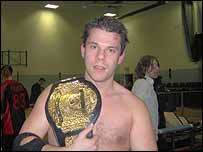 The Scottish Wrestling Alliance (SWA), established in 2003, had a shaky start to its ambitious plans. 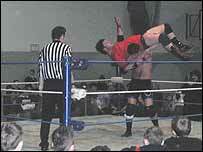 Its debut show, at the Time Capsule in Coatbridge, was cancelled two weeks before it was due to take place. "The manager flat refused to have wrestling at the venue," SWA promoter and wrestler Peter Murphy - aka Conscience - said. "That hit us hard financially because we'd already advertised and canvassed the area. "We initially had a lot of problems when we tried to book venues. We have to deal with people's prejudices because the WWE shows left a bad reputation with Scottish venues." The group, now based at the Sir Matt Busby Sports Complex at Bellshill, described the town as "the home of Scottish wrestling", with shows regularly attracting audiences of up to 500 people. Its latest offering, last weekend's Retribution II, catered for a largely family audience. It featured all the gimmicks of the American shows, albeit on a much smaller scale. "Obviously we don't have the money to throw at shows that the WWE have, but I think our in-ring product is better because we have a lot more heart and passion," Mr Murphy said. "Our show is a combination; the showbiz element from the Americans as well as the proper traditional wrestling of the old British days." The SWA also runs a training school for would-be pro-wrestlers and said it would produce the stars of the future. One of the big players on the Scottish scene, Eric 'the fist' Canyon, who secured the Scottish heavyweight title at Retribution II, said the pro-wrestling scene north of the border has seen a resurgence in recent years. He explained: "Audience numbers for our shows have been increasing all the time. Loads of people still watch pro-wrestling on TV so the market's there, we just have to tap into it." As for the common perception that the shows merely provide entertainment, rather than sporting prowess, Mr Canyon is philosophical. He said: "I train just as hard as other sportsmen so I think it's a sport in its own right, but I don't mind it being called entertainment. "I suppose you could call it brave theatre." However, for those involved in freestyle wrestling, which features in the Olympic and Commonwealth Games, pro-wrestling is a damaging distraction from what they see as the real sport. John Keogh, development officer with the Scottish Wrestling Association, said: "Freestyle is a serious sport but in people's minds it's lumped in with the showbiz stuff. People think the outcome of every type of wrestling is pre-determined. "When you talk about wrestling the first thing kids think of is the WWE. Some come to our clubs for the first time and start having doubts when they see that there's no ring. "They see all the pizzazz and it's hard for us to compete with that. We've got to convince them that it's worth sticking with it if they want to represent Scotland or the UK." Mr Keogh's son, Sean, is currently training in American for the 2010 Commonwealth Games in the wrestling-mad nation India. The 17-year-old, who wrestles from a club in Milngavie, will miss out on competing in next year's Melbourne games after the Australians dropped it from the roster. Scotland has recently dominated the Home Nations in freestyle wrestling, with many up and coming youngsters such as Sean Keogh, Findlay Marshall and the McKenna brothers making their mark. This year alone, Scottish athletes scooped 13 of the 27 British titles. Remarkably, the revival has been largely led by a dedicated group of parents and coaches. With £5,000 invested by Sportscotland in wrestling each year, Mr Keogh said the clubs must rely on funding from local councils, the Robertson and Birnie trusts. Mr Keogh said: "We take kids to tournaments, fundraise for the club and I've even installed a gym in my garage so the guys can train. The families have to sacrifice a lot." A Sportscotland spokeswoman said: "Since 1995, we have distributed £196,215 in Sportscotland Lottery funding towards wrestling."